This is a new opportunity for our church family to extend the love of Jesus to our friends at Don Julian (DJ) Elementary and in the community by providing groceries and building relationships for the gospel. But whoever has the world’s goods, and sees his brother in need and closes his heart against him, how does the love of God abide in him? Little children, let us not love with word or with tongue, but in deed and truth. (I John 3:17-18) We are on mission to love and touch the lives of our neighbors so they know Jesus cares. Partnering with the L.A. 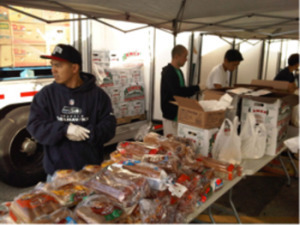 Regional Food Bank we will provide food for 300 Don Julian families. They will provide their mobile food truck filled with fresh produce, bread, yogurt, canned goods, and cereal to distribute. The cost of the food is free to Evergreen SGV. We provide the volunteers to hand the food out. This is a tangible way our community can actually experience the love and provision of Christ. We are humbled when we serve our neighbors because we are actually handing Jesus Christ a loaf of bread or bag of string beans. What a privilege and honor!